This morning, instead of logging off I got convinced to drag my Myrm through low sec just after downtime by my newest corp mate to do a DED site with him. It was a 4/10. Frankly, I'm still fuzzy about what that means but its something about how hard it is and what may drop inside of it. I'll look it up later when I have more time. Anyway, I got invited along and with my shield fit battle myrm of non-rawr power helped him work on the site. The site beat us up a bit. Finally, I got some armor repair drones and did the baby logi thing on my corp mate. Of course, he is a -10 so I got GCCed for repping him. Thanks CCP. I can't even rep a flashy red corp mate without getting GCC but I corp members in high sec can kill each other and not get flagged. So sensible. Once the items are sold, I'll have about 500 mil in my pocket. I also whipped out my low sec Noctis, much to his amusement, and cleaned the field. As we were playing local spiked up +1 with a cheetah landing and dropping core scanner probes. 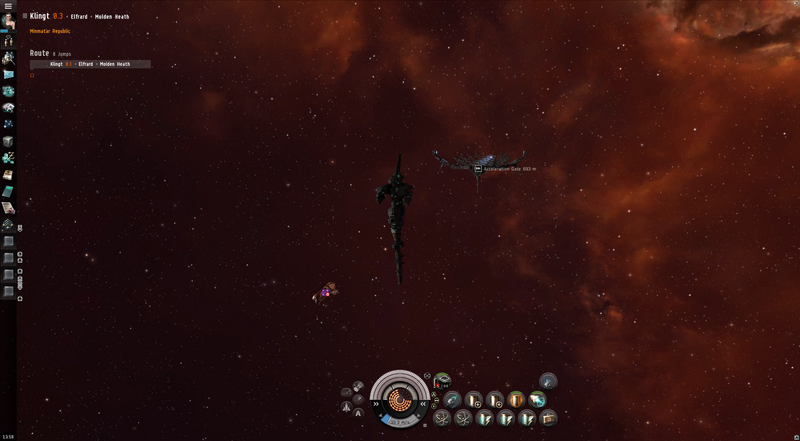 Because we were in a scannable site, we bailed and switched ships. Then he said hello in German in local so i whipped out google translate and started chatting with him. He belongs to a high sec corp that does some low sec stuff and he was looking for places to mine. He also sucked at probes. However, he is only two months older then I am. Still, I chatted and he chatted and eventually I got him to offer me the bookmarks for the site that he found. It happened to be the site we were already doing but the goal was to see how stupid he would be. Chatting with people is fine. However, when two low sec toons, with -sec status (-3 and -10) are encouraging you to go and do a site in the space they are currently active in, it may be a trap. He wound up docking and contracting me the bookmark. My flirt may be at level 5 but my siren call is still around a 3 it seems. With his location in place my corpie bounced over to that station and cloaked to try to snipe him. However he undocked + cloaked too fast. Damn. It was an interesting little event however. I felt weird about it, but at the same time, I'd never trust people if I was in the situation he was and I'd have been friendly but done everything in my power to avoid them. He did a good job. I've also been making a deal for an Oneiros. Since my friend builds stuff, lately, once he found out how many loyalty points I have hes been nabbing some stuff off me. He wanted a stabber fleet issue and he also offered to build and sell me an Oneiros. I asked for a price and in the end he decided on a second stabber fleet issue blueprint. That has me spending 40mil isk and 200k in loyalty points for an Oneiros. I'm cool with that. I guess if I was pinching loyalty points it could be better. I don't know, I'm cool with it.